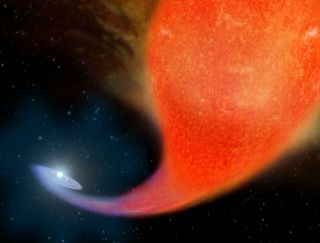 This artist's illustration depicts the birth of a blue straggler star as it siphons off material from a companion red giant star. New observations from the Hubble Space Telescope have revealed the hidden hosts feeding vampirelike blue straggler stars, strange objects that appear to stay uncannily young-looking instead of growing into old red giant stars. When an aging star exhausts most of its fuel, it balloons outward into a huge red giant. But in a cluster of stars that formed at the same time, some will look eerily young: While the stars' contemporaries are bulky and cooler, they remain trim with a hotter, bluer light as if they're getting infusions of new fuel. So blue straggler stars get their name because they "straggle" behind the typical star life cycle. Scientists have known about these blue stragglers since 1953, but the source of their extra fuel has remained a mystery. Researchers suspected they might be in a binary system — two stars which orbit each other closely — where one star siphons material off its partner star. But the mechanism wasn't certain. They could also have merged with other stars or collided with unlucky victims. A blue straggler star forms by siphoning the mass from a red giant star it closely orbits in a binary system. In the second frame, the bright, hot white straggler orbits the remains of the first star, now a faint white dwarf. A 2011 study surveyed the star cluster NGC 188 to investigate its blue straggler population, and now follow-up observations from the Hubble Space Telescope have revealed the ultraviolet signatures of white dwarf stars locked into orbit with seven of the blue stragglers. An additional seven show other evidence of mass transferring from another star, although white dwarfs haven't been spotted. "Until now there was no concrete observational proof, only suggestive results," Natalie Gosnell, an astronomer at the University of Texas, Austin, and lead author of the new work, said in a statement. "It's the first time we can place limits on the fraction of blue stragglers formed through mass transfer." For about two-thirds of the blue stragglers surveyed, this research confirms this mass transfer process. The more massive star in a binary system swells into a red giant, overshadowing its companion — but then, its mass is siphoned away by the companion star. The balance shifts as the companion star glows hotter and brighter with the extra mass until only the small, dense stellar core remains of the first star — it collapses into a white dwarf. Viewers from Earth see only the blue straggler as a single, unusually bright and hot star. The researchers sniffed out the white dwarfs' presence by detecting the stragglers' movement back and forth, caused by orbiting with another star, and verified it by identifying a bright ultraviolet signal with Hubble. Only signatures from the youngest, hottest white dwarfs can be detected that way, but the binary systems found will add to researchers' understanding of how stars grow and change in such systems. "For the evolution of single stars like our sun, by and large, we got it right, from birth to death," Mathieu said. "Now we're starting to do the same thing for the one-quarter of stars that are close-orbiting binaries. This work allows us to talk not about points of light, but about the evolution of galaxies, including our own Milky Way. That's a big deal, and getting it right is an even bigger deal." The new work was detailed Dec. 1 in The Astrophysical Journal.